Looking for a place to step back in time? Girard, Illinois a small central Illinois hamlet offers this great stop which serves lunch from behind an old time soda fountain in a former drugs store built in 1884. Besides the great food and ambience, there is a fascinating pharmacy museum. The drug store once sold drugs, groceries and hardware. Two brothers Robert “Bob and Wyman “Bill Deck were 3rd generation owners and they operated the drug store until 2001. The store operated for 117 years under the Deck family. The store now belongs to Bob and Renae Ernst owners of the Furniture Doctor. 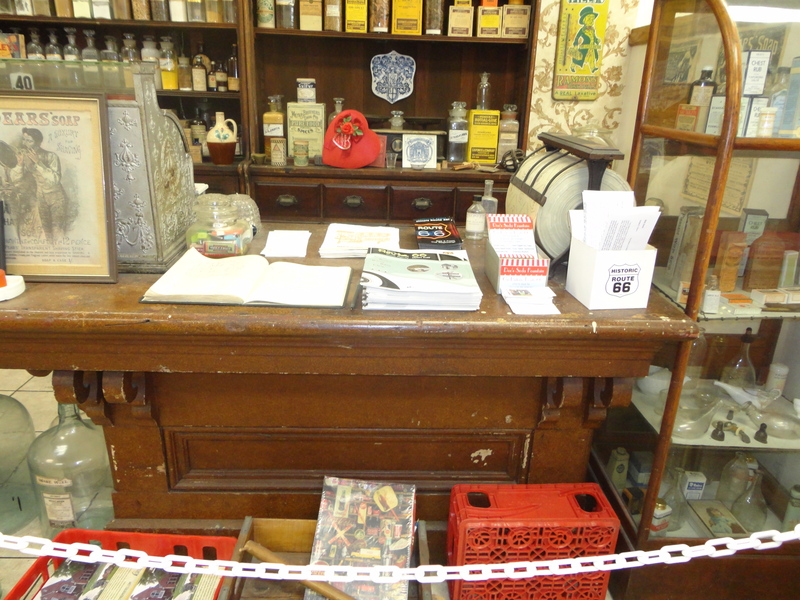 They opened the old soda fountain and began offering lunches and the Decks contributed their display of old patent medicines, remedies, early equipment and furniture for the Pharmacy museum. An interesting stop, the Ernst’s have expanded the store into the building next door and have Route 66 memorabilia on display as well as information about their drapes and upholstery service.